This weekend I re-read one of my all-time favorite comic books, the classic Watchmen by Alan Moore and Dave Gibbons. 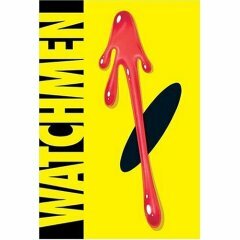 Watchmen, which takes place in the mid-1980s, was the first and probably still the best attempt at showing what a real Earth would be like if it were inhabited by super-heroes. The story examines how the world is changed politically, technologically, and socially when a few super-folks appear on the scene, especially one incredibly powerful man who happens to be American. The characters are developed in great depth, and all this plays out as the world careens toward a disastrous U.S. - Soviet war while great mysteries and plots are revealed. The list of praise for Watchmen is practically endless. It's the only comic book/graphic novel on Time Magazine's list of 100 greatest novels, and the only one to win a Hugo award. Joss Whedon and Damon Lindelof are among its fans. New articles are still being written about it. Blah blah blah. Just read Watchmen. And re-read it: every time you do, you'll find new bits of story, new meaning, and new visuals that you didn't notice before. Watchmen is still great, even though I was surprised to find that the pages of the book, now 20 years old, are starting to smell like old comic books. Recently I spent a week working at my company's office near Times Square in New York City. I've only been to NY about a half dozen times in my life, and I really like visiting. On my first morning there, I was walking to the office from my hotel a couple of blocks away when I felt a couple of raindrops. I looked on the ground and noticed that the "raindrops" were very big and kind of foamy. As a few of these smacked the ground rapidly, I wondered if I was under some sort of gross bird attack. Then I noticed that the foam was really soap. I looked up and found a window washer half a block away. This doesn't happen very often in Mountain View. I've heard from several folks interested in Mac jobs at Google, so here's more info. Google has several open Mac positions, including developers, product managers, and QA engineers. To see them, click here and here. And to see the Mac Engineering Manager job I posted about previously, go here. As before, if you want to find out more about any of these, you can send me email: sknaster (at) gmail.com. Three seconds after the penalties ended, Edmonton scored. We're looking for a highly technical Engineering Manager who can drive technical projects and provide leadership for a group of 15+ engineers in an innovative and fast paced environment. You will be responsible for the overall planning, execution, and success of Mac projects. • Very high technical competence, track record of strong coding and individual technical accomplishments, and strong academic record. • Proven track record shipping successful applications. • Entrepreneurial drive, demonstrated ability to achieve stretch goals in an innovative and fast paced environment. • 5+ years relevant experience managing large, fast-paced and dynamic engineering teams. • Solid leadership skills, experience building a strong engineering teams, influencing product direction, and providing updates to technical and non-technical audiences. • Establish credibility with smart engineers quickly. • Ability to mentor junior engineers via a formal mentoring relationship, reviewing code and design docs, teaching classes or acting as consultant on projects. • Demonstrated expertise in problem solving and technical innovation capable of "rolling up sleeves and getting hands dirty"
If you're interested in this very cool job, you can send your resume to jobs@google.com. Or if you want to find out more, ask your favorite Googler, or send me email at sknaster [at] gmail.com.